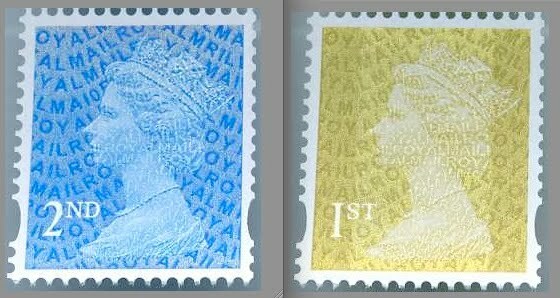 Thanks to Richard P we now have good pictures of the 1st & 2nd class stamps from the new coils. These are not self-adhesive and have no security slits, but they have the MRIL code at top right and MA10 code to the left of the head like the others with this code. Stamps from the coils of 500 and of 1000 appear to be the same. We'll be interested to know if any of these turn up in vending machines in or outside post offices, and if any are found on mail - other from dealers and other collectors, of course! We have a limited supply of these and other stamps with security features now listed on our e-commerce site. I've been searching around Post Offices to find a dispensing machine. (The ones with the 1st and 2nd 'buttons') Our local had one but was withdrawn. Any idea where in the London Area such machines still exist? Golden Machin Horizon labels nationwide - update. More New Security Machins on sale at London 2010.